As stores and the internet light up with gift ideas in time for Christmas, you may have a senior or two on your list. Last year we put together a long list of potential gifts for older adults, which can he found here. Please enjoy this updated list that I hope can help you give thoughtfully and generously. A subscription to audible books. A connection to programs at the library, where many have programs for people with vision impairment and audible books. Download old radio programs they may enjoy and put them on CD for them to play. Boxed sets of TV comedy shows or other genres from earlier decades, such as I Love Lucy or The Honeymooners. Search shows by genre and decade at www.tv.com and then buy disc sets on Amazon. This stick is really for anyone at any age, but it and similar competitors turn selfies into much better photos. I’m thinking of those seniors who are posting to Facebook, or travelling to the Great Wall of China or Greece next year and need great photos with this selfie stick! There is no time like the holidays to arrange more social interaction for the post-holiday season. Connecting people to people and getting them to be more active is practically a magic pill for health and wellbeing, so it’s a great gift for the holidays. Help set them up with a phone call service, like the Friendship Line. Help them connect to a little brother service, of which many do holiday home visits. Investigate the local senior services in the area, find one near your giftee, and go with him or her to the senior center over the holidays to check it out and connect them. For those who like to cook but hate to shop, there are those services that send you all the right ingredients and instructions and you just do the prep and eating. These deliver anywhere in the US. Compression hosiery, which helps with leg swelling, made an appearance on the Paris runways this year. It is a good gift for people who get uncomfortable swelling and fits in with the stocking theme of the holidays. Sadly, an organization in LA, ProjectCARES, lost their donated gifts for seniors to a fire. Their work reminds me that in all our communities there are organizations who work with seniors in need and could use your donation. Look for a local organization that takes gift donations. Hope these are helpful-- please give us feedback! She appreciates not having to cook every night. 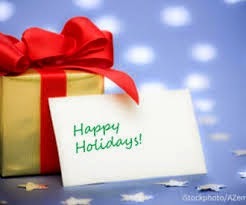 A little late for 2014 holidays, but take a look at GrandBox http://www.mygrandbox.com/, it's a monthly subscription care package curated especially for seniors. One of the best gifts I gave my grandma was a senior-friendly puppy -- lazy, cute small dog that does not bark (the pup we gave her was a shih tzu). She was quite entertained with the little guy and it was low maintenance. Just feed and scoop poop. Which she had maids to do that.